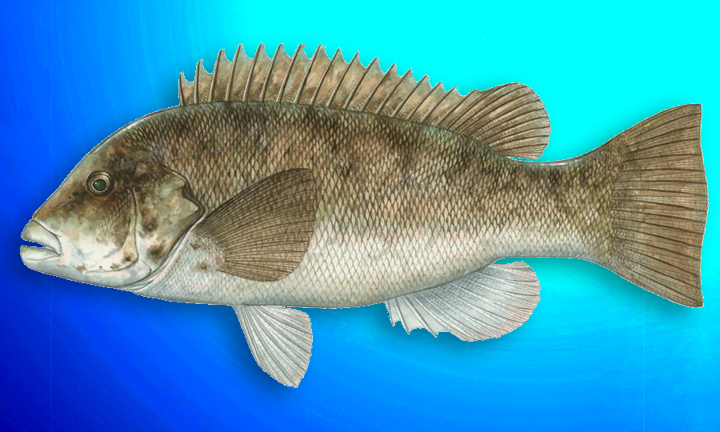 Tautog live in inshore habitats around rock outcroppings, breakwaters, wrecks and other sheltered habitat. It is a highly territorial fish and only moves to slightly deeper water in the winter. This makes them easy to catch and susceptible to overfishing. With its strong jaw, it feeds on mussels and other shellfish. They reach sexual maturity around three to four years of age and are slow growing living up to 40 years. The fish spawn offshore in the late spring and early summer. Eggs hatch in the ocean and then juveniles find protected sheltered waters hiding in seaweed, eelgrass and other marine vegetation. Although they range along the Northeast Atlantic coast, the greatest abundance is between Cape Cod and Chesapeake Bay.